Can anyone truly be prepared for greatness? Or is it a matter of luck? The protagonists of Narnia, The Lord of the Rings, Harry Potter, The Hunger Games, Divergent and many other popular series of adventure tales are all thrust into dangerous, challenging situations, and happen to rise to the occasion, becoming heroes who inspire in us a sense of possibility that touches an ancient yearning we all have. We want to believe that we too could rise, and, perhaps, will, when confronted with our toughest difficulties and trials. And most parents would hope the same thing about their children. But is it ultimately a matter of happenstance, or genes, or of a more mysterious destiny? Or, on the contrary, is there something we can do to prepare for the possibility of greatness? This new series suggests that we can prepare for greatness, and shows how. A highly acclaimed thriller novelist has described these books as, “The Alchemist meets Harry Potter meets Indiana Jones.” This is multi volume coming-of-age story about a group of young teens and adults, who have a deep experience of human nature and, along with it, a more realistic experience of the paranormal, or the more mysterious aspects of life, than what you might expect from current fiction. Its focus is on a thirteen-year-old boy, Walid Shabeezar, and his friends, under the guidance of Walid’s wise, strong, and sometimes funny seventy-year-old uncle, Ali – who, unknown to his young nephew until the end of the first book, is a man whose past and future will radically revolutionize Walid’s life. Imagine that the world's oldest story—the epic of Gilgamesh, from 2700 BCE—was actually true and that this astonishing fact, revealed to us now through a series of events happening in a reimagined Egypt in the years 1934 and 1935, will explain the origin of all our greatest art, science, literature and philosophy. Imagine further that a few other of the most famous heroic stories through time, like the first great English tale, the Epic of Beowulf, are also based on real events and that they reveal to us possibilities in our deepest nature for human discovery and power that most of us would never even guess we have. It's a tale that explains the impact of Plato's two most famous stories and shows the truth of Aristotle's most important insight. It's also a story that reveals the common ground beneath some of the oldest spirituality and the newest physics. Walid and the Mysteries of Phi. 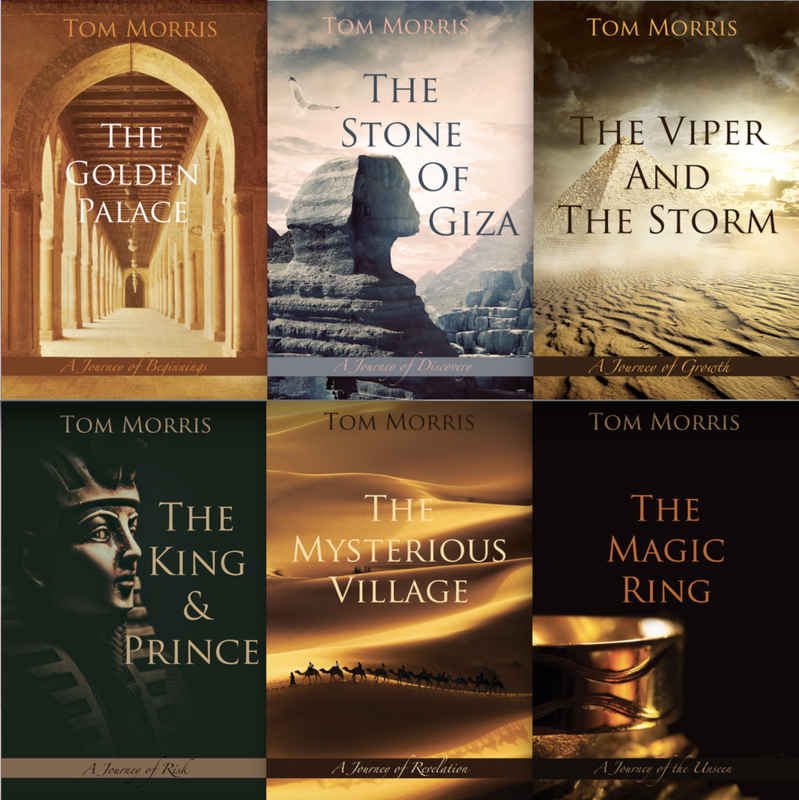 The stories are set in a re-imagined Egypt in 1934 and 1935. They encompass and play off some of the best practical wisdom from throughout the ages, as well as deeper spiritual perspectives about the power of the mind, the nature of reality, and, eventually, the possibilities for personal transformation and redemption from even terrible choices. The short book The Oasis Within is a sort of prologue and companion to the novels, which presents a series of conversations between Walid and his uncle during a trip across the desert by camel. Through these discussions, we gradually come to know two main characters of the series. But we soon meet several more, and they are just as important to the overall epic story as Walid and his Uncle Ali. The novels that follow this prologue, numbered as books 1-7 in the series proper, are action-adventure-suspense-thriller tales that revolve around deep philosophical perspectives and involve a secret society, warriors, mystics, gunfights, bombs, crime lords, apparently paranormal events, mysterious numbers, and formidable antagonists whose plans for the kingdom set up the main challenges that Walid and his friends have to face. Two powerful women and their highly skilled daughters play a crucial role in Walid’s ability to survive, flourish, and, hopefully, prevail. Khaldoun A. Sweis, Ph.D., Associate Professor of Philosophy, Olive-Harvey College. Tutor in Philosophy, Oxford University, UK. Donna Karlin, Author of Leaders, and Founder and President of A Better Perspective. Stephen D. Coggins, JD, Attorney, Rountree Losee, and International Force for Good. The prologue or prelude to the series, The Oasis Within, is now available, as are books one through five. Click on book covers throughout the site to order. Book Seven, The Ancient Scroll, is expected in late winter or early spring, 2019.